The folks over at B.F. Day Elementary School want to make sure you’re aware of two upcoming events. First, the latest B.F. Day Playground Improvement Project community meeting is coming up Wednesday, March 7 between 6 – 8 p.m. The meeting will take place in B.F. Day Elementary School Gymnasium. How do you use the B.F. Day playground? Imagine an improved park and playground in the heart of Fremont. Come be a part of the design of process! Last chance to tell us what your priorities are. The more community involvement, the better! 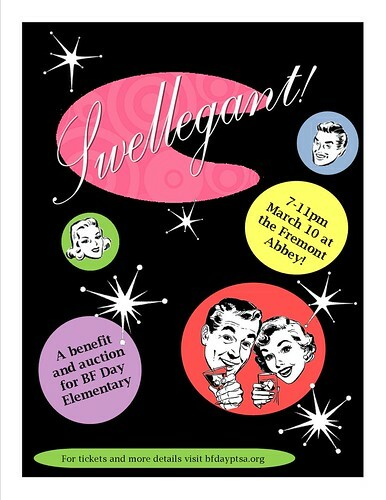 The other event is the annual Swellegant cocktail party to raise money for arts and science enrichment in the classroom, which takes place March 10th. Not only will this fundraising event benefit children’s learning experience and support our neighborhood school, but it’s a unique opportunity to meet and mingle with BF Day parents, neighbors, and new friends in your community. Music and dancing, dinner and drinks, that’s Swellegant. It’s all happening Saturday, March 10th at the Fremont Abbey, 7-11pm. Tickets are $45 in advance and $60 at the door. Visit bfdayptsa.org for more details. 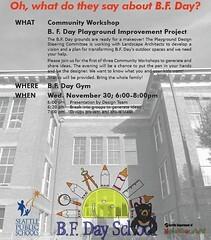 In case you missed the first community workshop for the B.F. Day Playground Design Steering Committee, you’ve got a chance to make it to the second one. Join the second of three Community Workshops to generate and share ideas for transforming B.F. Day’s outdoor spaces. Bring your own ideas and bring your children as their input is appreciate as well. Even if you don’t have children at B.F. Day, you’re input is important. After all, the school playground is open to the public any time school is not in session. There are also two Facebook groups you can join to stay up to date with what’s going on at B.F. Day. Future Parents of B.F. Day Elementary and B.F. Day PTSA. On Tuesday, Seattle Public Schools announced proposed changes to the boundaries of the John Stanford International School in Wallingford. The changes were presented at a PTA meeting and will be voted on by the full School Board on Jan. 18. 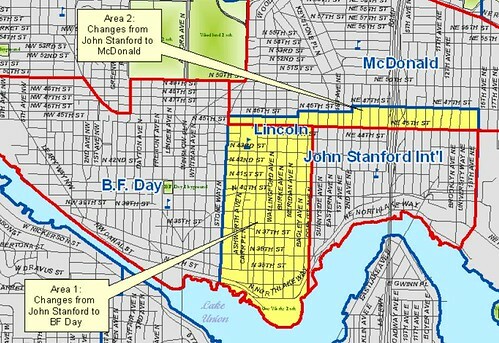 These boundary changes would also impact McDonald Elementary and Fremont’s B.F. Day Elementary School. According to the release, the John Stanford International School is currently overcrowded and use exceeds the optimal use of the rooms. With no boundary change, the school will only continue to get more crowded based on projections. The combined capacity for McDonald Elementary and Stanford can only support the population within the combined current boundary for two more years at most. In order to keep siblings together and alleviate overcrowding, the school district is proposing a plan that will offer predictability to all families. Once approved, all those impacted by the boundary change will know where their student will attend school in September 2012. Offers a plan to bring the number of JSIS homerooms back to a sustainable level. The School Board will vote on this plan on Jan. 18. The B.F. Day Elementary School grounds are ready for a makeover. The Playground Design Steering Committee is working with Landscape Architects to develop a vision and a plan for transforming B.F. Day’s outdoor spaces and they are looking for your help. Join the first of three Community Workshops to generate and share ideas. Bring your own ideas and bring your children as their input is appreciate as well. Even if you don’t have children at B.F. Day, you’re input is important. After all, the school playground is open to the public any time school is not in session. 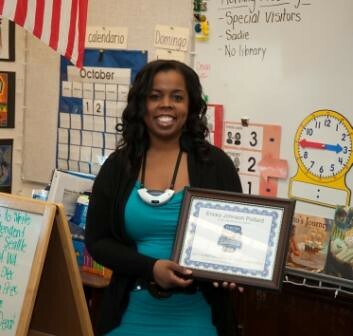 Symetra Financial and the Seattle Seahawks honored B.F. Day Elementary School second grade teacher Ericka Johnson Pollard as a “Symetra Hero in the Classroom” on Nov. 2 during a special classroom event. “Ericka Johnson Pollard is in her third year of teaching, but teaches as if she has been doing it for years. She has a class of 26 very lively seven- and eight-year-olds, and she builds a rapport with each child by focusing on high expectations and a belief that they will achieve at their highest level,” said Susan McClosey, principal of B.F. Day Elementary School.”Mrs. Pollard plans her curriculum so that students are actively engaged in their learning, with rich classroom discussions. She also takes them outside of the classroom to embrace the learning that can take place all over our wonderful city of Seattle. The class might visit a local Fremont business or hop on a city bus and head downtown to the Experience Music Project. She figures out what each student needs to be challenged and plans her lessons to meet those challenges.” McCloskey nominated Pollard for the Symetra Hero in the Classroom award. “The care that Mrs. Pollard feels for her students and her desire for their success comes through in her daily interactions, said McCloskey. “She is constantly telling them how smart they are, how well-behaved they are and how much she enjoys working with them. She loves her job, and her students know it. More information about Symetra Heroes in the Classroom is available at www.symetra.com/heroes. B.F. Day Elementary School is looking for volunteers to help tutor students in reading and math. You don’t have to be a teacher or have a teaching degree. You just need to bring a “mentoring attitude” with you to help first-through-fifth graders learn. The mentoring takes place Tuesdays and/or Thursdays from 3:00 to 4:15 p.m. from October 18, 2011 through April 5, 2012 at B.F. Day Elementary School. All materials will be provided. Volunteers that speak a foreign language are in demand as well. Orientation will be provided Oct.11 and Oct.13 between 3-4:00 pm. or by appointment. Training is available and service learning credit will be given. For almost 15 years, Seattle Audubon has provided the Finding Urban Nature (FUN) program for free at B. F. Day School and other schools around Seattle. The FUN program introduces 3rd and 4th grade students to producers, consumers, and decomposers in their schoolyard habitat and how they depend on each other to survive. Volunteer guides take a small group of up to six students outside to learn about their schoolyard habitat, first hand. Each classroom receives four different lessons in the fall and four more in the spring. This year, B.F. Day is a looking for some volunteers to help with the program. Volunteers do not need any previous experience and training will be provided. You can learn more about the program at their website. To find out how to become a volunteer, email the Elementary School Program Manager at fun@seattleaudubon.org. Neighborhood club Future Parents of BF Day is hosting a multi-family yard sale Sunday, July 24th to benefit B.F. Day Elementary. All proceeds will be donated to the school to help deal with the budget crisis that all public schools are facing. The sale will be held at 4422 Phinney Ave N (a private residence) from 9am to 3pm. Now that families know where their kids will go to elementary school, folks with babies, toddlers and preschoolers can get inspired early to bolster their neighborhood schools.The group is also hoping the yard sale is a great way for neighbors to meet, chat and mingle. For more information on the yard sale, check out this site.